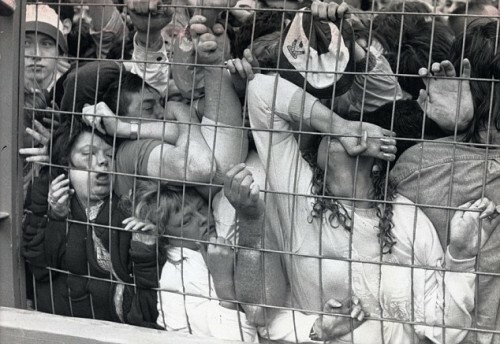 The 1989 crowd crush that took the life of 96 people in Hillsborough Stadium in England. Courtesy of Canadian Content. Say the name “Hillsborough” to an American and stupefaction will inevitably follow. Say the same name to an Englishman and his memories will summon tears. In 1989 when Liverpool squared off against the Nottingham Forest in the semifinal round of the Football Association Challenge Cup, what started off as a normal soccer outing became a national tragedy. Due to a combination of poor planning, an unexpectedly large number of fans, understaffing of police, and outdated crowd management procedures, Hillsborough Stadium in Sheffield, England was a disaster waiting to happen. As a throng of fans flooded the stadium, the result was a “crowd crush”: a stampede that creates a one-thousand pound compressive force capable of bending steel. The chaotic throng ultimately led to the death of 96 fans and injured 766 others. Such staggering figures are not unique to England. More recent events include Germany’s annual “Love Parade,” an electronic dance music festival that led to the asphyxiation of 21 concertgoers in July 2010. In 2008, a Black Friday stampede at a Wal-Mart on Long Island led to the death of an employee. Agents dressed in suit-and-tie act autonomously from one another. Paul Torrens’s model allows him to simulate many different types of people — parents with children, the young, the old, and even the drunk. Such heterogeneous behavior is not scripted. Courtesy of Discover Magazine. Although crowds in urban settings form, scatter, and reform every day without frequent calamity, these crowd-related disasters show that crowd dynamics are still poorly understood. Luckily, Dr. Paul Torrens, Associate Professor of Geographical Sciences at the University of Maryland, has developed a technology that can help. Torrens’s work lies at the forefront of geosimulation, which uses computer programs to model how agents interact with geographic environments. He simulates the behavior of human crowds in various locations such as city streets, movie theaters, and open fields. 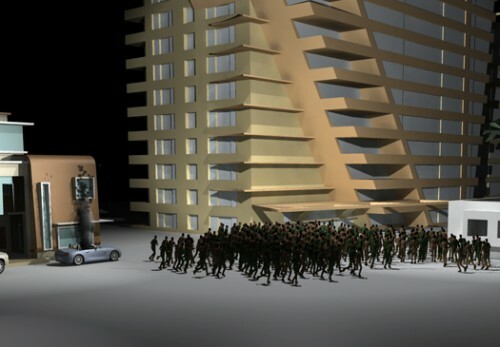 By recreating these scenarios using computer modeling, Torrens can work with many crowd-related situations that cannot be tested in real life, such as a crowd running away from a burning car or escaping a collapsing building. 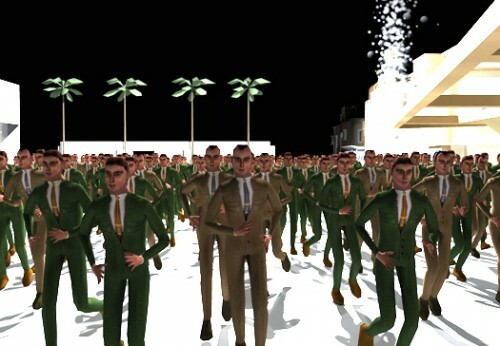 Unlike most crowd simulations, in which crowds simply think and move as a single entity, Torrens’s models achieve a new level of realism: He can give individual agents emotions, instincts, and the artificial intelligence to “think” for themselves. This reveals numerous insights about how interactions between individual crowd members affect crowd dynamics. For instance, in determining how crowds respond to police, Torrens initially assigns each agent a “Legitimacy score”, from 0 to 1, where 0 represents the most rebellious agent and 1 is the most deferent. During the simulation, agents are dynamic: such Legitimacy scores will likely change over time, as agents are influenced by the decisions of their neighbors, which is analogous to how real crowds function. A crowd running from a burning car in an urban setting. Paul Torrens’s simulations reproduce complex crowd behaviors that occur in response to situations like these. Courtesy of Discover Magazine. In addition to modeling behavioral traits, Torrens also realistically captures human movement. His agents see with synthetic vision, develop mental maps, plan paths through an environment, and even navigate between waypoints that they see as interesting or not interesting — depending on the task at hand. To generate the necessary data, he tracks the motion of subjects that walk through a studio with motion capture devices affixed to their limbs. This data, provides the computer-simulated agents with the spatiotemporal information necessary to function like real people; by gauging where they are in space and time, they know when to accelerate, decelerate, and stop. Torrens, unlike his colleagues before him, simulates their actual movement, but does not script their movement. After giving his agents the artificial ability to think and act autonomously, Torrens wraps them in lifelike geographic environments, such as a city street or shopping mall, that are modeled in code. Torrens’s simulations allow him to create an extraordinary scenario, like someone shouting “fire,” and then view the ensuing evacuation. With the help of this technology, he can analyze many factors that affect the risk of injury: how fast individuals move, the location and width of exits, and the formation of bottlenecks. 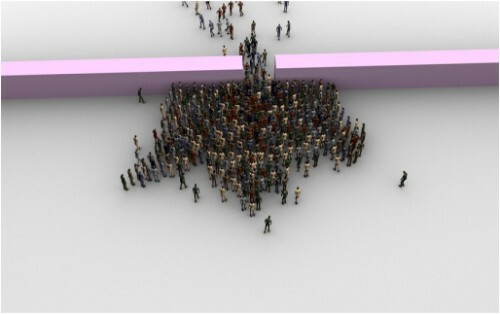 For instance, Torrens’s work has shown that when a cylindrical column is placed off-center in front of an exit wedge-like bottlenecks do not form; the barrier impedes the egressing crowd, causing them to slow down and ultimately decongest. The amazing thing about Torrens’s technology is the applications it has for real-life situations. By combining particle physics, vector theory, computer schemes, and cognitive models generated from human subjects, he makes his agents as realistic as possible. This allows Torrens to drop them into a novel environment and observe what happens, providing insight into typical riotous crowds, or even brand new situations. After running a simulation, bottlenecks like the one pictured here often develop. Paul Torrens examines how crowd behavior is affected when certain parameters are changed. Courtesy of Discover Magazine. Crowds form the social infrastructure for a lot of our daily lives. Thus, understanding how they function enables authorities to plan for emergencies, police to respond to them, and architects to build stadiums appropriately so that events like the Hillsborough disaster never happen again.